﻿	Alpha Stamps News » A Sweet, Simple House and Halloween?! A Sweet, Simple House and Halloween?! While I am a HUGE fan of farting around on a project for ages and ages, and taking a zillion times longer than I should, and fiddling with a 100 different pieces and adding 14 dozen different types of embellishments… sometimes the opposite is nice. Sometimes, I like playing with a couple of sheets of paper that already match. Let’s face it, some days just aren’t made for thinking too much. Some days designing and making arty farty choices is hard! That’s kind of how this wee house came around. I just sort of day dreamed as I went along. Cross my lazy heart it didn’t take much to change the house box. I simply omitted the back piece, trimmed the tabs on the sides, and added a folded bit of card to make the roof. Nah! There are only 9 fussy cut elements inside that house (and four of those are butterflies which really hardly count at all!) The elements are cut from Spring Farmhouse Simple Things Scrapbook Paper, and Spring Farmhouse 8×8 Paper Pad. The pretty vintage girl is from the Flower Girls Collage Sheet. As for the outside, I really didn’t do anything. I just covered the front and sides with a sheet from the Spring Farmhouse Pad. And used a wood look paper to for the roof. A butterfly and snipped sentiment and that’s it! Beautiful! I love Nichola’s artwork! Remember to come back after reading the rest of Nichola’s blog post for new goodies, a new sale and a drawing to win EVERYTHING in Nichola’s supply list! Ooh! 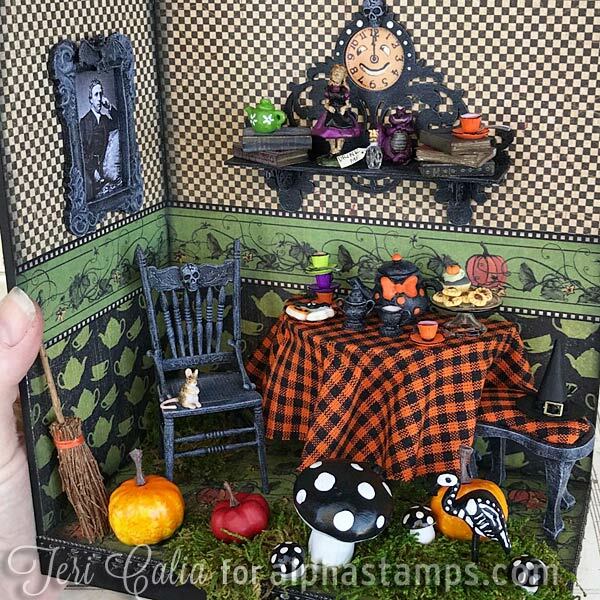 Do you remember that fab Halloween in Wonderland Room Box by Teri Calia (shown at left)? Well, all the papers Teri used to decorate her room box are in this Collector's Edition 12x12 Pack! More info is in the original blog post and you can also see Teri's supply list. Tracy Roos Collage Sheets ON SALE! Inspired by Nichola’s artwork: ALL Tracy Roos Collage Sheets are on SALE at 50% off! Beside that sweet collage sheet with the girl in Nichola’s artwork, Tracy’s collage sheets include themes from Easter to Halloween to Christmas! The sale ends at midnight TOMORROW NIGHT, March 18th. Yes, I said it! EVERYTHING in Nichola’s Supply List is included in today’s Giveaway! Note: if an item is duplicated in the Spring Farmhouse Kit (included in the Giveaway) and also listed separately in the supply list, I’m just including one of those items. 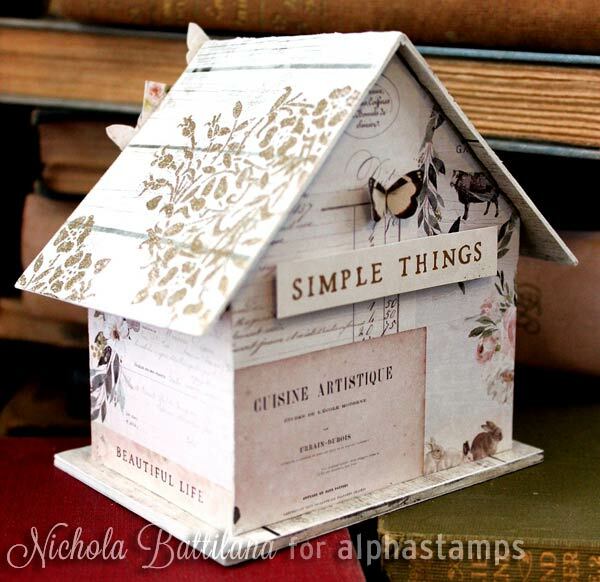 To enter the Simple Things House Giveaway drawing all you have to do is leave a comment BELOW on this blog post TODAY or TOMORROW (the deadline is 11:59 pm PST, Monday Night, March 18, 2019). Hey, who won the A Miniature Collector’s Giveaway from Thursday’s newsletter? That would be Janet Stoffel! Congrats! Check your email for info. March 17th, 2019 at 7:47 am. This is just simply lovely! Such fun details! March 17th, 2019 at 7:50 am. March 17th, 2019 at 7:55 am. Every picture tells a story. These houses are perfect for seasonal details. March 17th, 2019 at 7:59 am. The little house is wonderful. March 17th, 2019 at 8:03 am. March 17th, 2019 at 8:08 am. March 17th, 2019 at 8:12 am. The little house could be used for so many projects. Great ideas! March 17th, 2019 at 8:14 am. Love the simple things house. March 17th, 2019 at 8:16 am. That is so pretty! I love it and would definitely make something similar! March 17th, 2019 at 8:21 am. I like the sweet & Springy house. I would like to make a similar one. March 17th, 2019 at 8:29 am. March 17th, 2019 at 8:33 am. Awesome projects! Love that Halloween scene, and that’s the theme I’d go for too! March 17th, 2019 at 8:36 am. Love the little house and back to Halloween! Hooray! March 17th, 2019 at 8:41 am. March 17th, 2019 at 8:50 am. The Halloween room is spectacular! Wonderful little house. Would probably make something similar. Another inspiring project. March 17th, 2019 at 11:03 am. Simple is just the best. March 17th, 2019 at 11:10 am. I am a sucker for any type house and this is on my list to make! March 17th, 2019 at 11:25 am. I just love this! It would be perfect sitting on my bookshelf! March 17th, 2019 at 11:45 am. Such a sweet project! I would add glitter to make it a glitter house!! March 17th, 2019 at 12:12 pm. I often find that simple is spectacular! The little house would become a 2 room gnome home surrounded by a little fish pond and waterfall. Since Gnorm and Gnevaeh Gnome love gardening their roof will be flat and covered in flowers 💐 🌸 🌺 💐! TFS! March 17th, 2019 at 12:17 pm. This is just too adorable! Thanks for offering this as a giveaway! March 17th, 2019 at 12:19 pm. March 17th, 2019 at 12:29 pm. Dreamy! I would make a series using all the flower girls. March 17th, 2019 at 12:31 pm. March 17th, 2019 at 3:13 pm. March 17th, 2019 at 4:29 pm. March 17th, 2019 at 4:59 pm. I would have to move a Halloween scene into that little house . March 17th, 2019 at 5:34 pm. The little house is adorable and it’s never too early for Halloween! March 17th, 2019 at 6:06 pm. 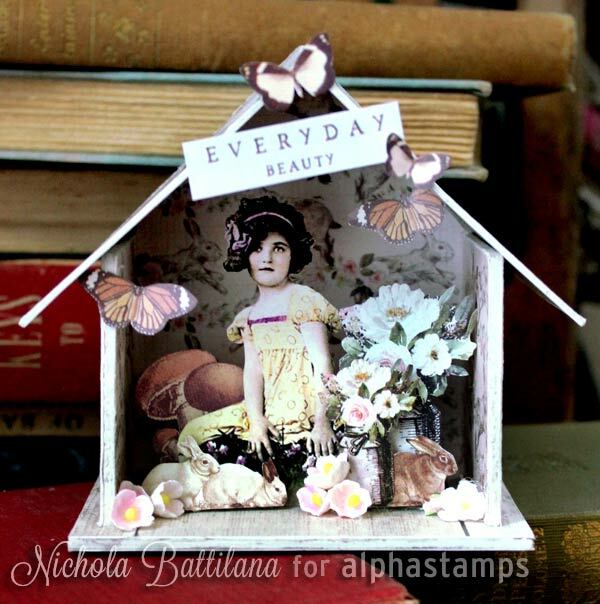 I adore Nichola’s little house, it is “simply” dear and wonderful. I would make something similar with spring and Easter and farm animals, bunnies, chipmunks and flowers in mind! March 17th, 2019 at 7:51 pm. March 17th, 2019 at 8:36 pm. The little house is adorable! I would love to make an Easter theme house for my mantle. March 17th, 2019 at 8:53 pm. March 17th, 2019 at 9:03 pm. March 17th, 2019 at 10:44 pm. I would make a shrine using my grandma as the theme. March 18th, 2019 at 5:04 am. I love the serene expression on the little girl. So sweet. March 18th, 2019 at 5:18 am. I love this little house. It would be great to make for Mother’s Day! March 18th, 2019 at 5:20 am. This is adorable! I would love to make a Halloween room. March 18th, 2019 at 5:48 am. March 18th, 2019 at 5:55 am. Mothers Day is a good idea for this house! March 18th, 2019 at 5:56 am. March 18th, 2019 at 6:10 am. I just LOVE Nichola”s work! Her work always inspires me to get started on a project and victorian themed anything is my favorite. I would like to “build” this house but with different images and “wee” things. March 18th, 2019 at 6:28 am. Love this! Would definitely make an “Alice” room! March 18th, 2019 at 6:44 am. March 18th, 2019 at 8:48 am. I so look forward to your emails! I get a creative spark every time I see what other folks are making. I save all your emails in a special folder so that when I’m feeling ‘stuck’ I can look at them to get inspired! March 18th, 2019 at 10:39 am. I agree – simple and sweet! March 18th, 2019 at 12:56 pm. I would love to win the giveaway to try to make a little house for Halloween. I have never made a miniature before, but would love to try! March 18th, 2019 at 3:12 pm. So adorable. I would do Halloween or maybe Christmas in it. March 18th, 2019 at 10:29 pm.